I’ve been keeping a close eye out for work by Troscan Design, and late last night they released this brilliant film on founder and accomplished furniture designer Bob Robinson. Originally my goal was to show my appreciation for the furniture and the general forms that they create at Troscan Design, but it turns out Bob also has a passion for making string instruments and creates both classic and flamenco guitars. The video itself offers a behind-the-scenes look at Bob’s workshop and his passion for making. Troscan design is run by husband-and-wife team, Deirdre Jordan and Bob Robinson, with Deirdre having a creative eye and architectural background, Bob being trained as a master woodworker and luthier. 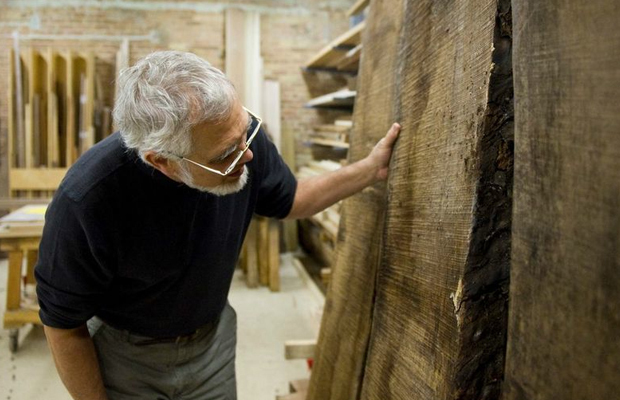 As you can imagine over the years Bob has a deep knowledge of wood as a material and is very precise with his work, never settling for second best. What struck me was the overall authenticity to both the design process and the way they use the materials, they look at everything holistically and philosophically. I keep drawing parallels with the Nakashima workshop headed by Mira Nakashima, who we interviewed late last year, and the way in which they create. This particular video for some reason also reminded me of the Eames duo with the steam bending process, I’ve always wondered what it would be like to do this and have been thinking about making a piece of furniture myself using a similar process. Just for experimental purposes that is. For now you can watch the actual technique in this video below produced by I do Films, with Bob guiding you through from start to finish. He even explains how he draws up the patterns at the start to get the shape of the guitar! If you have some more time to explore I’d recommend checking out their new gallery named Room 406 which is Deirdre’s gallery space above the Troscan workshop in Chicago, Ilinois. You won’t be disappointed by their selection and general aesthetic.